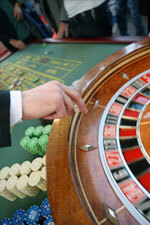 Roulette game is very famous among both brick and mortar and online casino players. This game is not very difficult because the game's rules are rather simple for understanding and the outcome depends mainly on luck and chance; but still there are a lot of different strategies of playing and winning Roulette. All these make the game very exciting. The most well-known of them are American and European. The first one is used in most land based casinos. The difference between these two types of the Roulette wheel is that American has 36 numbered red and black pockets and two green zero slots: "0" and "00" while its European counterpart has no "double zero" slot. At the first sight it may seem no big deal, but, as a matter of fact, it makes huge difference in the house edge which is 5.26% for American Roulette and 2.7% for European. It means that one has more chances to win playing European Roulette. That is why it can be rather difficult to find "single zero" Roulette wheel in land casinos. But it is possible to find it in online casino. Straight-up - a bet which should be placed on a single number. Split - a bet which should be placed between two adjoining numbers. Street - three numbers bet. Corner - this bet can also be called square anÐ² placed on four numbers. Six Line - a bet which should be placed on two streets. Trio - this bet is possible only on "single zero" Roulette and should be placed between 0, 1 and 2; 0, 2 and 3. Basket - this one is possible only on American Roulette. The chip should be put on the intersection of 3 numbers. Top Line - this one is also possible only on American Roulette. The chip should be placed between 0 and 1 or 00 and 3. Dozen - a bet on 1-12, 13-24 or 15-36. Column - a bet on 12 numbers of a vertical line. Playing Outside bets one has smaller payouts but better winning odds.